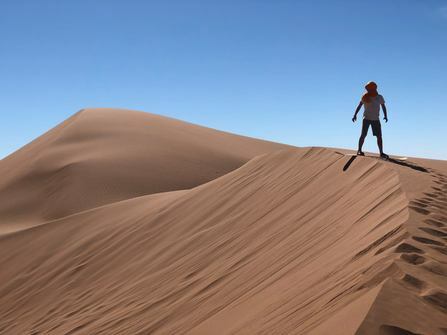 Located on the edge of the Erg Chegaga dunes, the desert camp is a tranquil and luxurious hideaway, situated well away from the many other camps in the dunes, guaranteeing a peaceful experience. With five tents, the camp can accommodate up to 10 people. The camp is centred around a beautiful camp fire and offers spacious communal accommodation, including sun loungers, a relaxing salon and a dining tent. Service is attentive and you can expect thoughtful touches such as sundowner drinks and a constant supply of nibbles and drinks throughout your stay! 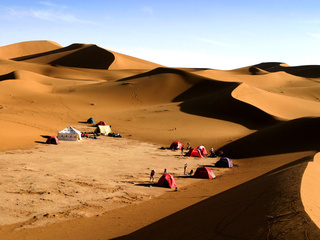 The Erg Chegaga luxury desert camp is without doubt the best desert camp in Morocco. 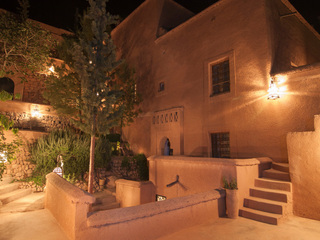 Stays are all inlusive of meals, alcoholic drinks and most activities (camel treks, sandboarding, sundowners etc. are included, exceptions are activities such as ATV). Each tent has a king-size bed (which can be made into 2 singles), with high quality individual sprung mattresses and linen. There are also ‘wall to wall’ plush rugs, a full-length mirror, bedside tables and solar lamps, an armchair and ottoman and space to hang your clothes. Each item has been handmade in Morocco. From your bedroom you walk into your spacious bathroom, in a separate but adjoining tent. The bathroom has a toilet, make up area, washbasin and wash area. 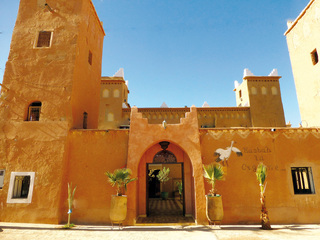 Fluffy towels, soaps, argan oil, and other ‘goodies’ are also provided.